Ahem, and now for a walk down memory lane – something you know that I love to do. I want you to know that this was a BEAR of a job getting all these photos uploaded, so PLEASE look at all the photos and read descriptions and my guess as to why they were contained in my little time capsule of my childhood jewelry box. In fact, I am sure I had a good reason for keeping all of these things, but some of the items seem like they were destined to be found just to represent the time and era — as if I knew I was making a time capsule. Note: Sorry for the blurriness of some photos. I used my phone camera and I am about to get a new phone as the camera is not focusing well these days. 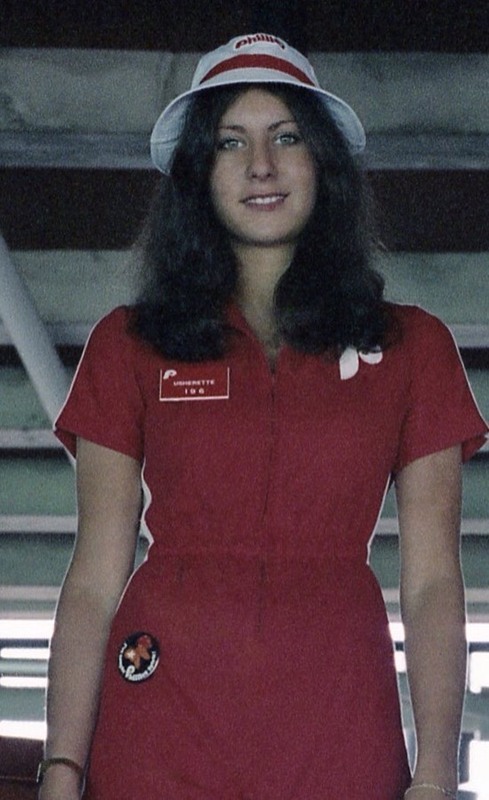 My crazy reason for looking through boxes of memorabilia was because I got a bit obsessive about wanting to prove that I still had a pin that I wore on my hip from the photo a stranger just sent me of myself from 1979. All of the memorabilia boxes are in the attic and I never know what I am going to find when I start diving in. Some boxes are known entities as I have re-visited them often such as the one with high school memorabilia, love letters and diaries, and the one for college memorabilia and my first trips on airplanes etc. Yet I could not locate where my Phillies memorabilia was – I worked for them through college and grad school. I even told my husband that I was determined to find those Phillies things and sure enough, they turned up once I found their mysterious safe hiding place. 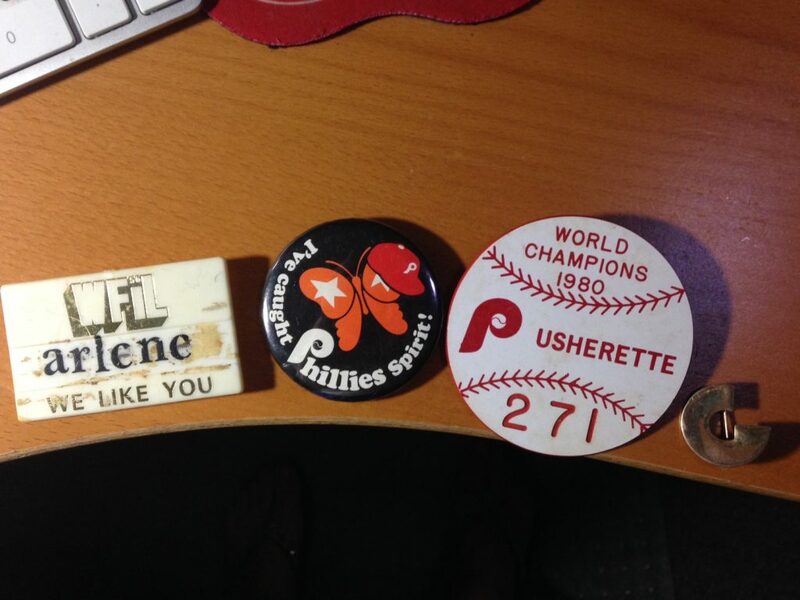 Please note that my WFIL Boss Chick (a short lived job just post high school) badge was in there too. You can also see the G pin for Girard Bank (long defunct) where I did a LOT of promotions for the Phillies team. I wore that on my uniform as well. 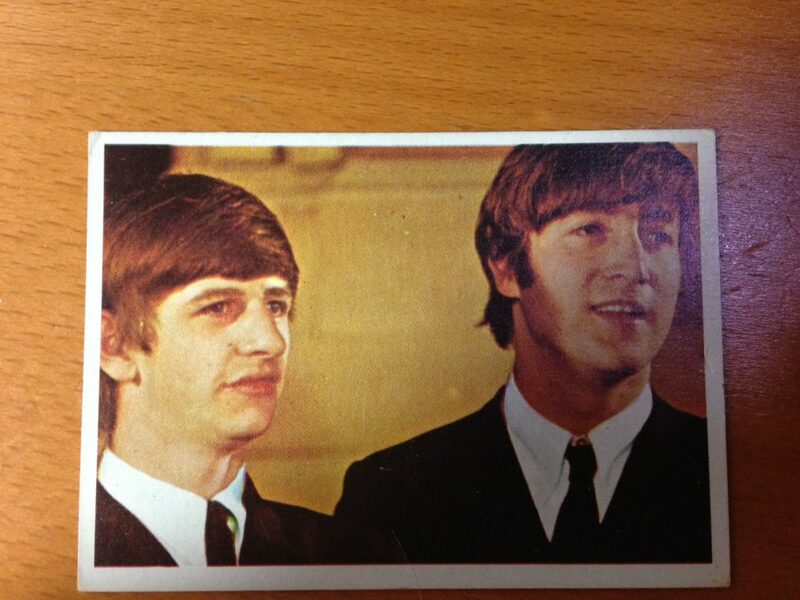 Next up is a Beatles card. 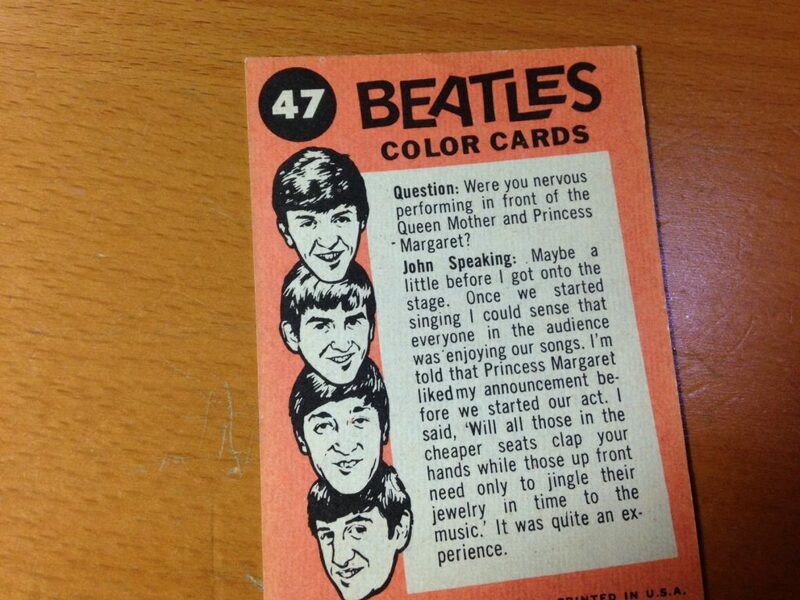 An original from 1964, tucked away in there and not even featuring Paul, my favorite. Remember all those trading cards we had? 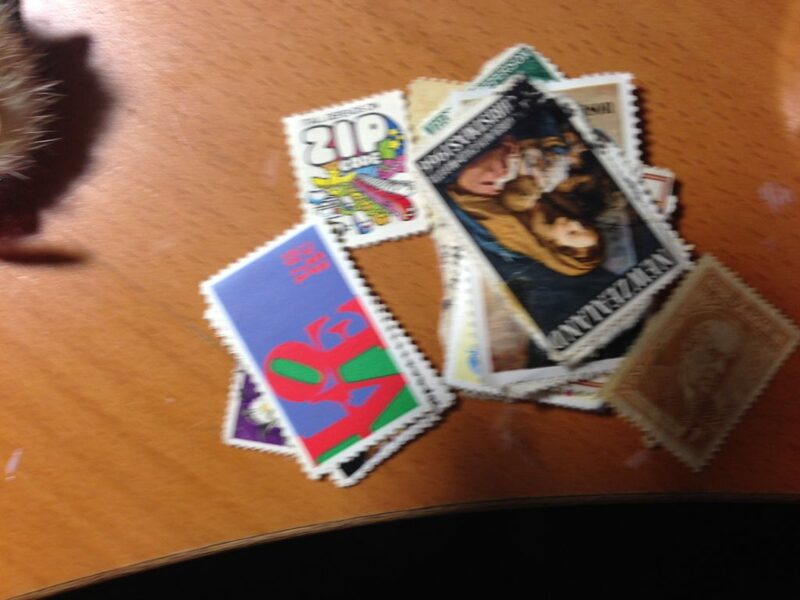 I know I have more, I just have to hunt some more in my attic to find elementary school memorabilia. It must be in a box somewhere!! Perhaps my next mission. 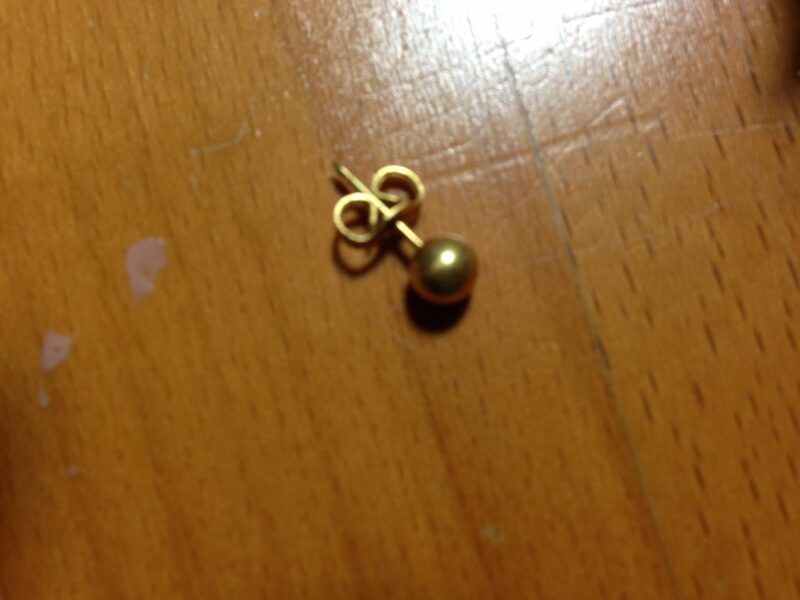 Below you will find my first earrings when I got my ears pierced in sixth grade. Note there is only one left. I was notorious at losing earrings. We all had those little gold balls in those days. 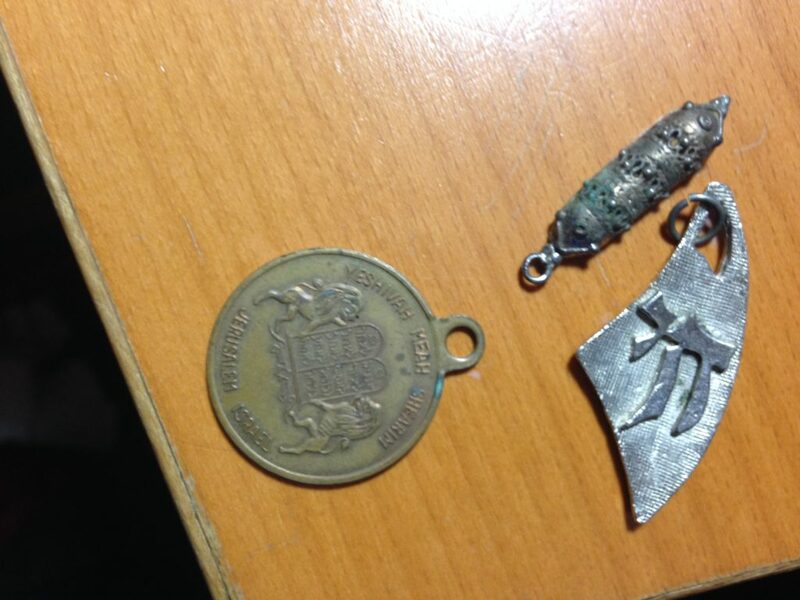 Next are the two items ALWAYS seen on my wrists throughout High School. One is a POW bracelet, and the other was my mod lucite watch. Girls from the late sixties and early 70’s – I know you will relate to those items. 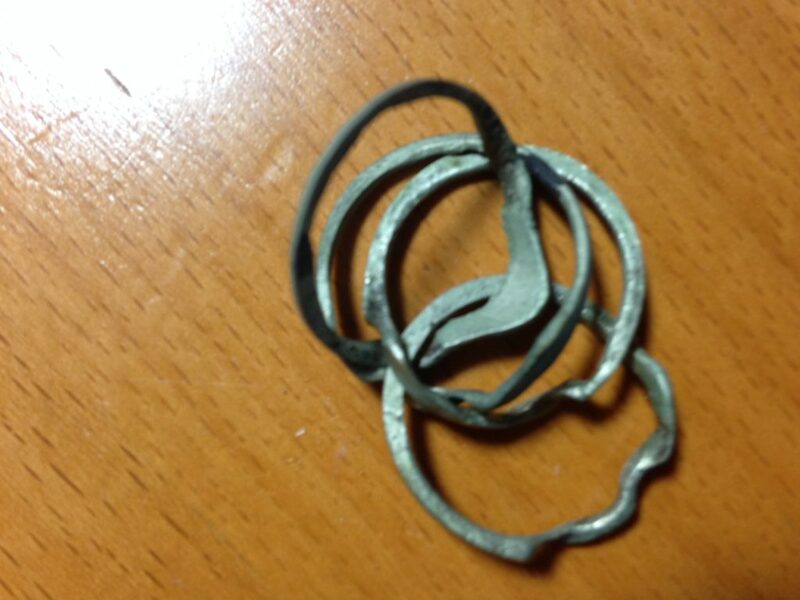 And now we have the two rings I wore through high school – the famous PUZZLE rings that we would take off in class and break apart to put together. We had these before Rubik’s Cube was even a thought. And of course I had a tiny mood ring too. 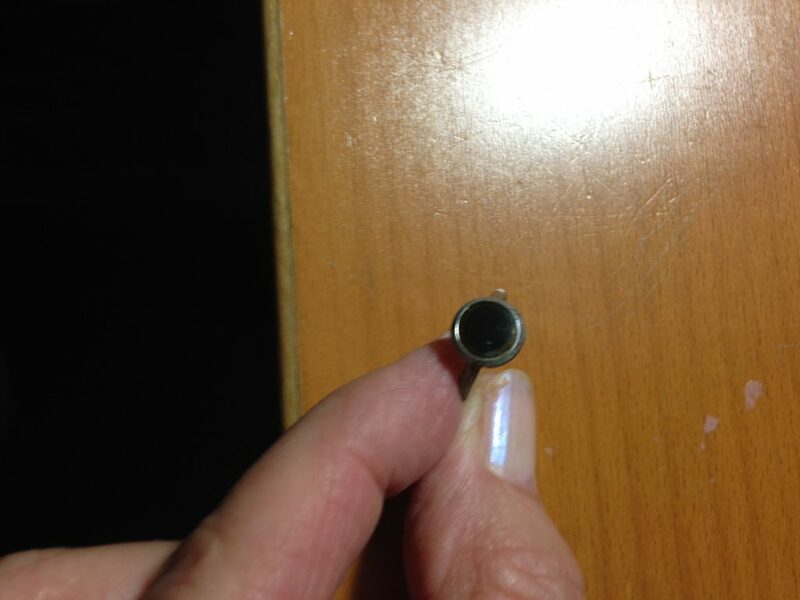 I forgot to try on that tiny mood ring to see if it still works and the black turns a color! 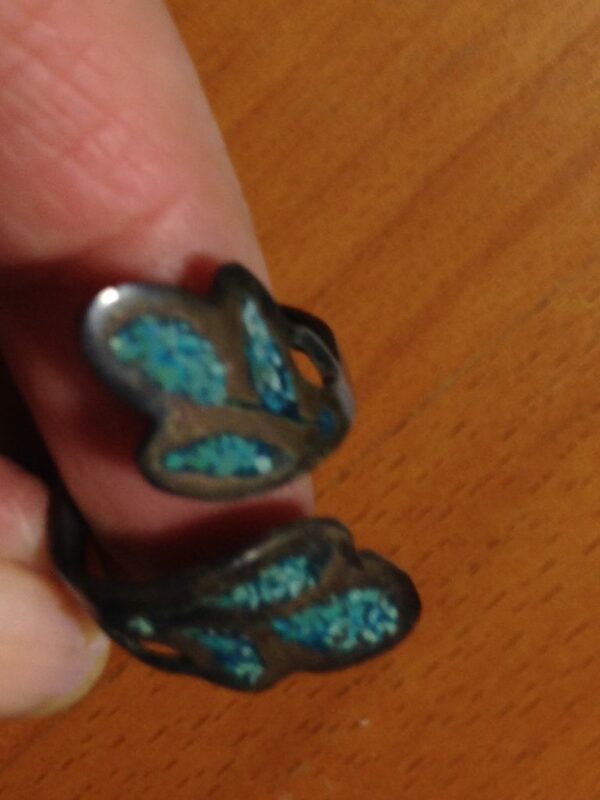 Next is the other ring I wore all the time – a silver and turquoise one my Gram and Pop brought me back from Israel. 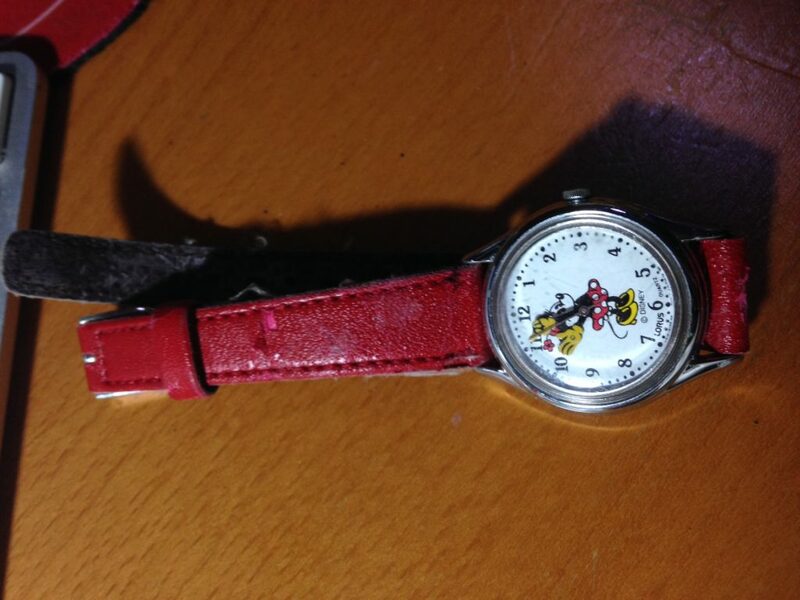 Below is a Minnie Mouse watch. I did not have it as a kid, but believe I purchased it in college. I had always wanted one as a child, but you have heard the old, “we were poor” stories before. 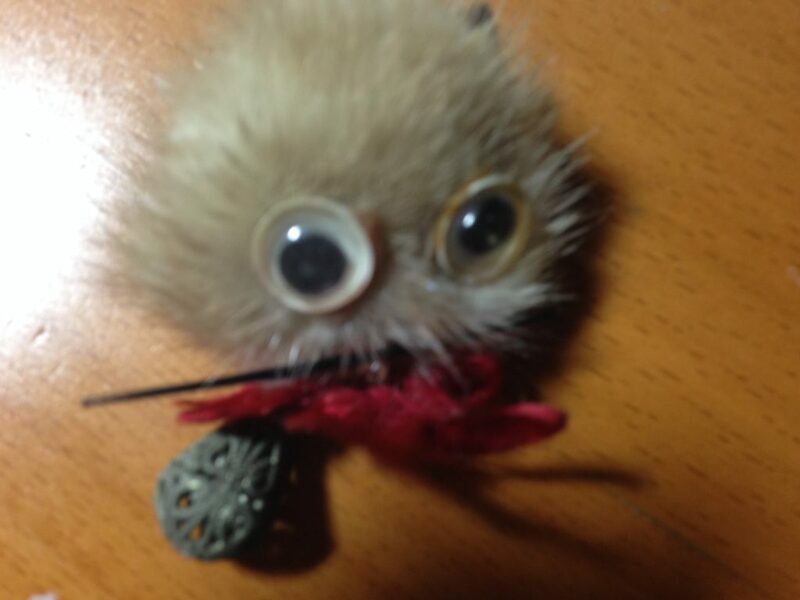 I also found a “mink” pin that was given to me by my junior high boyfriend. 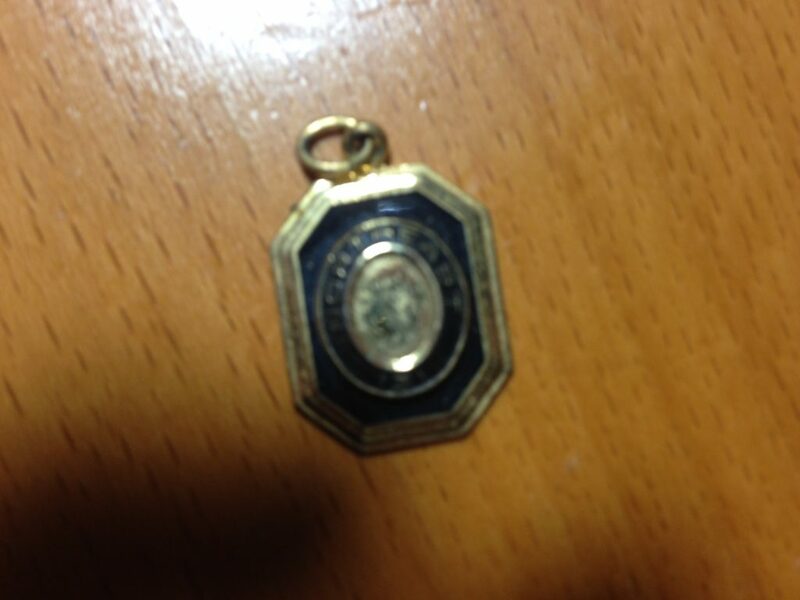 I kept it just because he gave it to me, but it has sat in the jewelry box unused and not worn since then. I guess I felt it was an important loving gesture to remember. 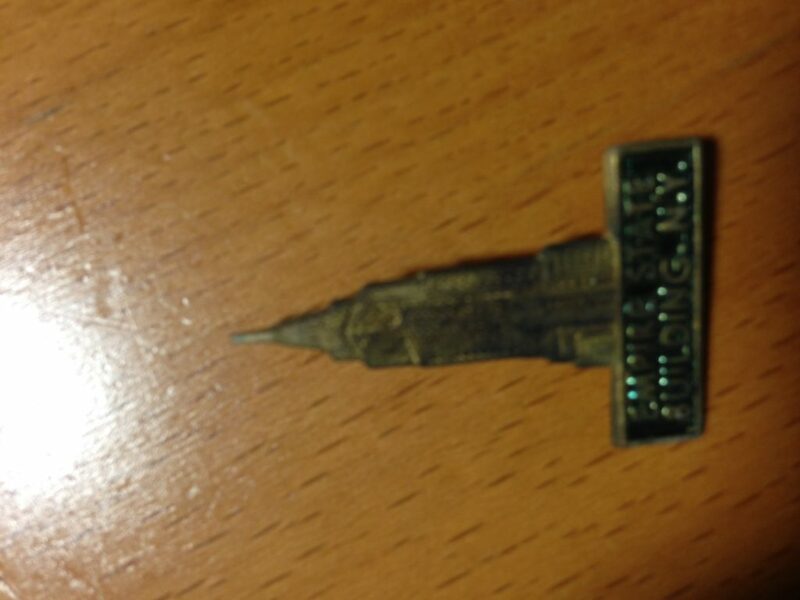 The next two items were given to me by my maternal grandparents, Nanny and Pop-Pop, and one is an Empire State Building pin and the other is a charm bracelet. Next are some time capsule things that I put in there to memorialize the place and time it was. 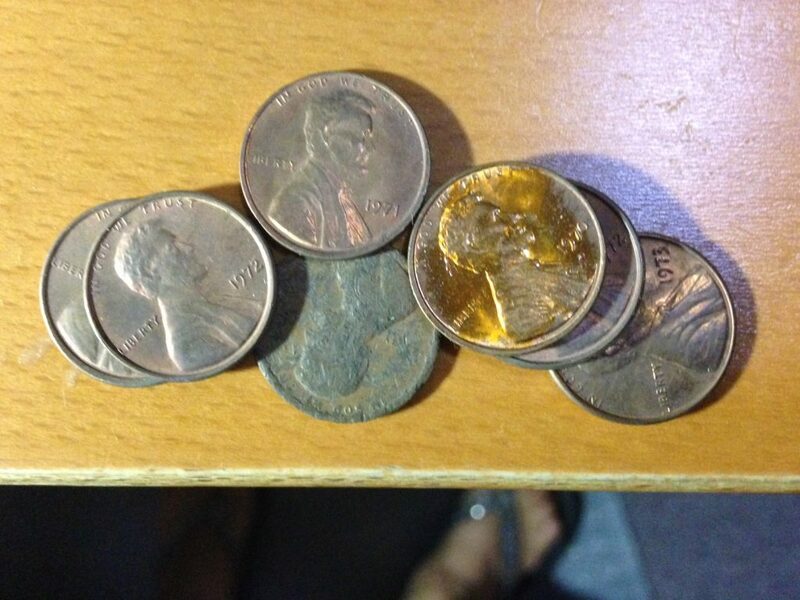 The first are pennies, once BRAND NEW and SHINY and now old and tarnished. I remember putting in brand new pennies for the years 1970, 71,72, and 73 – my high school years and my first year in college. 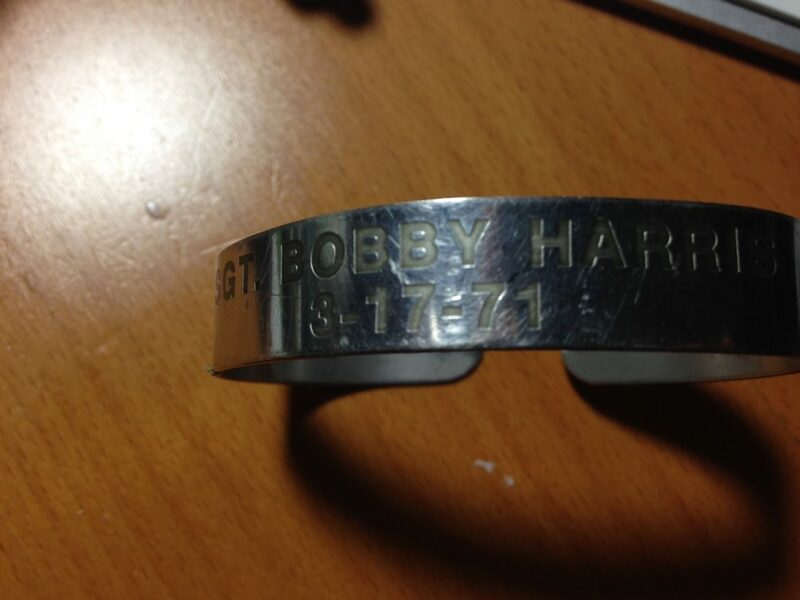 Last but certainly not least were two ticket stubs that were put into that precious jewelry box much later – in the eighties as it also contained my daughter’s baby bracelet (she was born in 1987). 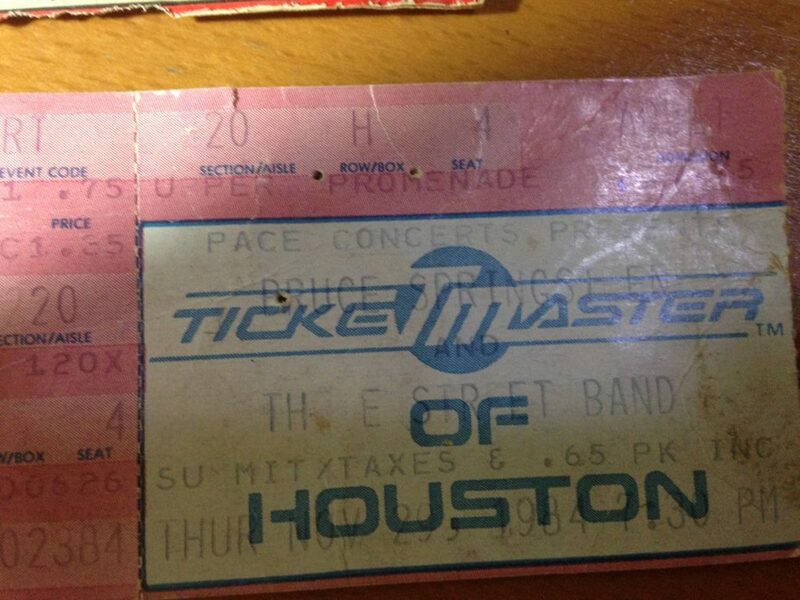 One is a stub of a late November 1984 Bruce Springsteen concert. I was nine months pregnant and rocking out to Bruce for that one. Brett came two weeks later. The next ticket stub was extremely momentous for me. 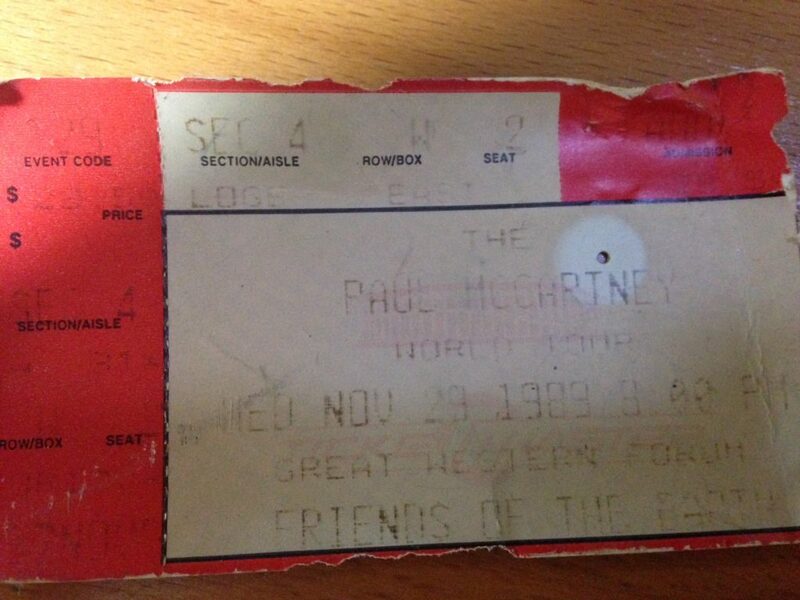 It was my very first concert seeing my Beatles idol Paul McCartney for the first time. (now five times under my belt) It was a magical occasion because I traveled to LA for it – my husband had business there and we scored 10th row seats on the floor. Paul crooned to me as if nobody else was in the room for that wonderful concert. I will never forget that feeling as long as I live. It was certainly a dream come true. In fact, though I have been to some incredible concerts – more than the average person, and have been on cloud nine many times during bucket list concerts, this first “Paul” show was one of the top ever in my memory. The year was 1989. So there you have it. 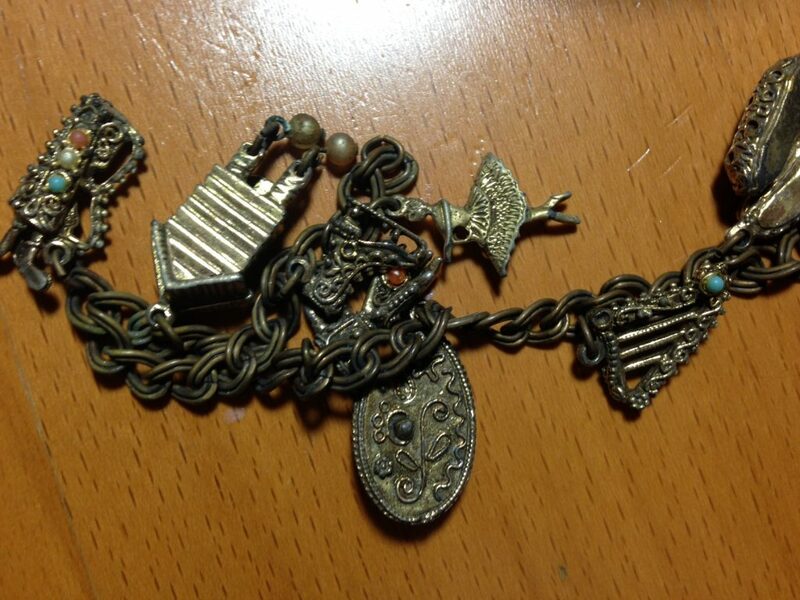 My jewelry as a mod teen, some sentimental childhood things, and some time capsule items – all in my old childhood jewelry box. Hope you have enjoyed this look into the past. I know you too would give anything to take a look into your old childhood jewelry box some 35 years after not looking within as I just did. It was an incredible experience and gave me so many smiles and a few laughs too. Let me hear what yours contained! It’s nice that you have a lot of things to look back on and remember from your early days. 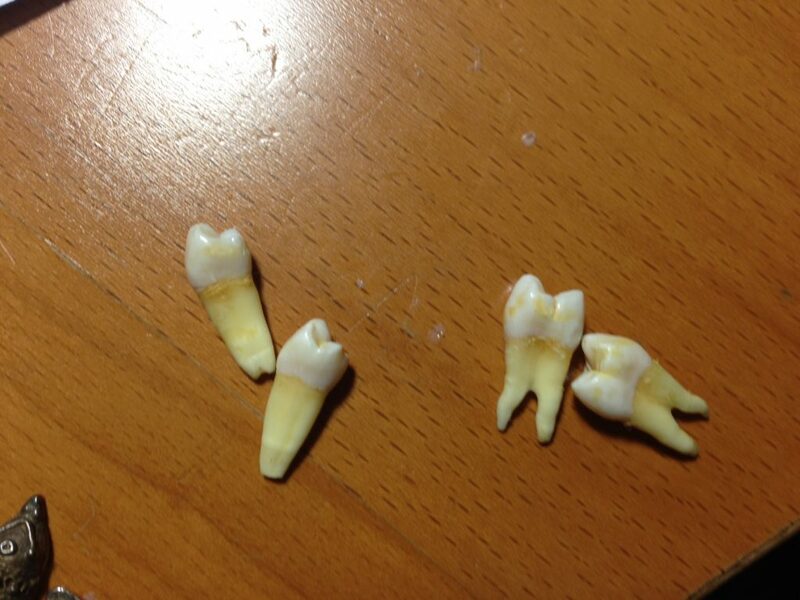 They seem to have been preserved well in that jewelry box. 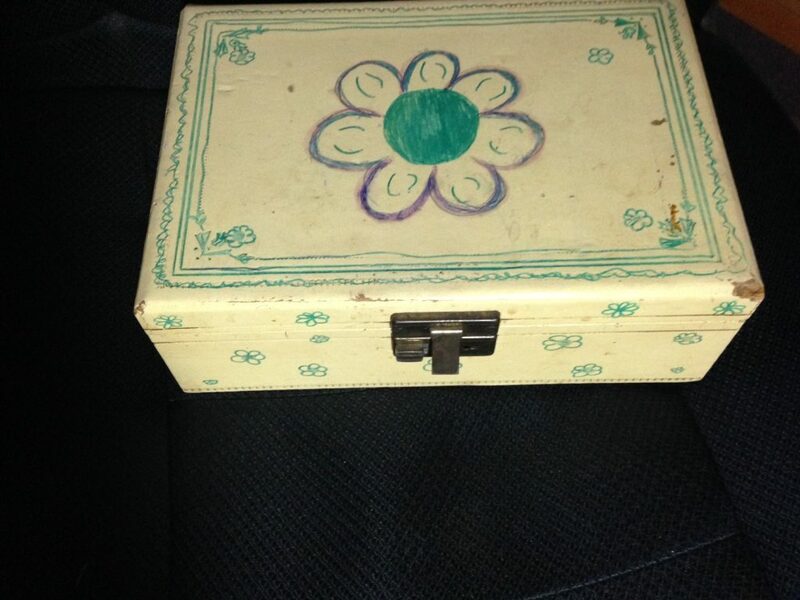 My teenage jewelry box accompanied me to be my adult jewelry box, when I got married in 1973. 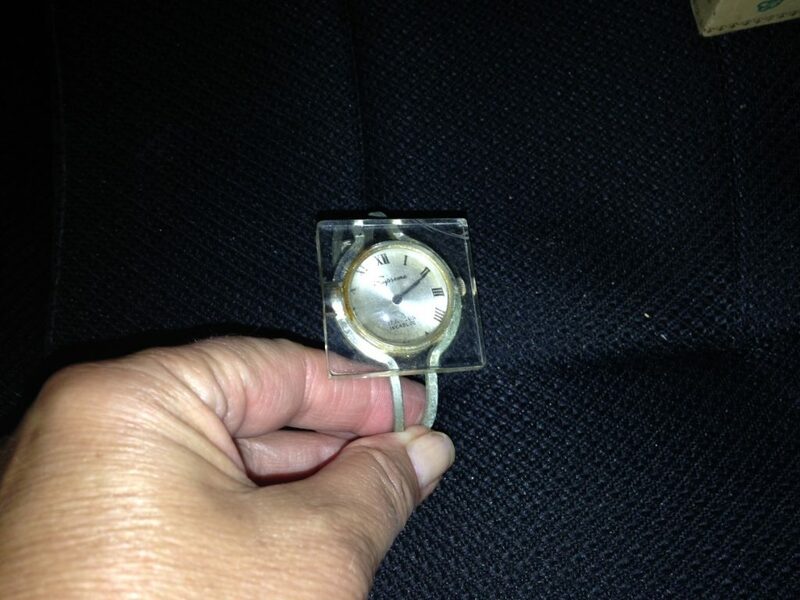 My husband and I bought our first house in 1977 and within a few days we were burglarized, because we hadn’t yet secured the sliding glass door with a piece of wood in the tract. A lot of things were stolen from my jewelry box that had strong memories for me: like my Philadelphia High School For Girls birthstone ring, my sterling silver mascot charm, and all the jewelry that I had received for my Sweet 16. A few items remain, and I have made them into charms that I will wear on a sterling silver bracelet with other charms that symbolize significant memories. I remember having an envelope full of tickets from any kind of event that I went to from my high school and college years. But, when I got married and moved, they were thrown out with many other things that kids will often leave behind when they move out of their parents home. The jewelry box itself did not hold special meaning, so when it got to be too small to hold my ever-increasing collection of jewelry, I must have thrown that out, as well. Today, I have a memory box (VERY LARGE) filled with every card my children have ever made for me, as well as bought for me, throughout their lives. It also includes special cards from family and friends throughout every year. It includes my high school yearbook, diploma, and photo of my entire graduation class on stage, at the Academy of Music. It includes certificates of awards that I received and my Bachelor’s and Master’s diplomas from Temple University. I’ve kept artwork that my children made, that I could not bear to part with, in the same box. I also have every love letter that I received during my 26 single years between husbands. This includes the many love letters that I received from Warren. Everything is organized in clean clear baggies. I pull my box out once a year to add the year’s collection to them. Now I keep the handmade cards from my grandchildren! When I do this annual task, I always pick several bags and items out to take my own lovely trip down memory lane. You and I are so much alike – so sentimental! I love to look through my memorabilia that I am amazed that I even have since I moved SIX times in Philadelphia, and then to Houston and since then five more moves. It is miraculous I have these things, really. And I enjoy having them and sharing. Thanks so much for sharing your story. It is so similar to my own. As I was reading this journey into your time capsule jewelry box, it reminded me of many of the things I wish I would have kept from my growing up years. But just reading this brought back so many wonderful memories that I had long forgotten. Thank you for bringing these great memories and many smiles to my face as I relived them in my mind. Thanks for sharing this Marilyn! It means the world to me. Very cool collection Arlene! Wish I still had our HS beanie and pin for class 131. I will send you a photo of those things, as I still have them.